Diversified Communications UK Ltd (Diversified UK) is a fast growing trade event organiser and publisher based in Brighton, Peterborough, Leamington Spa, and Nailsworth, Glos. Its brand portfolio includes: •	Casual Dining (24-25 February 2016, Business Design Centre, London) www.casualdiningshow.co.uk •	British Tourism & Travel Show - Best of Britain & ireland (16-17 March 2016, NEC, Birmingham) www.tourismshow.co.uk •	Ocean Business, Offshore Survey Conference & Ocean Careers (April 2017, National Oceanography Centre, Southampton) www.oceanbusiness.com •	Natural & Organic Products Europe (17-18 April 2016, ExCeL, London) www.naturalproducts.co.uk •	Geo Business (24-25 May 2016, Business Design Centre, London) www.geobusinessshow.com •	SITS - The IT Service Management Show (8-9 June 2016, Olympia, London) www.servicedeskshow.com •	MARELEC International Marine Electromagnetics conference www.marelec.co.uk •	lunch! 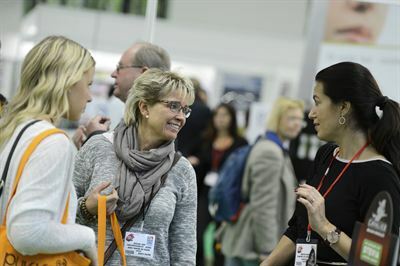 (24-25 September 2015, Business Design Centre, London) www.lunchshow.co.uk •	camexpo (26-27 September 2015, Olympia National Hall, London) www.camexpo.co.uk •	Coach & Bus Live (30 September - 1 October, 2015, NEC, Birmingham) www.coachandbuslive.com/ •	office* (13-14 October 2015, Olympia National Hall, London) www.officeshow.co.uk •	Natural Products Scandinavia & Nordic Organic Food Fair (1-2 November 2015, MalmöMassan, Sweden) www.naturalproductsscandinavia.com & www.nordicorganicexpo.com •	Euro Bus Expo (1-3 November 2016, NEC, Birmingham) www.eurobusxpo.com •	Natural Products is Britain’s leading trade magazine for the natural and organic products industry (www.naturalproductsonline.co.uk) •	The Natural Beauty Yearbook is the UK’s only dedicated trade guide to the natural and organic beauty and personal care market (www.naturalbeautyyearbook.co.uk) •	Ocean Buzz is the weekly ocean technology eNewsletter providing the latest news and information from the industry (www.oceanbuzz.co.uk) •	ServiceDesk360.com is a news, comment and discussion site dedicated to connecting, informing and learning within the ITSM community (www.servicedesk360.com) •	Route One is the market-leading coach and bus industry weekly magazine (www.route-one.net) •	Coach Monthly is the leading magazine for the coach tourism community, read by coach operators, tour planners and industry professionals (www.route-one.net) •	Route One is the market-leading coach and bus industry weekly magazine (www.route-one.net) Diversified UK is part of Diversified Communications, a leading international media company providing market access, education and information through global, national and regional face-to-face events, eMedia, publications and television stations. Diversified serves a number of industries including: seafood, food service, natural and organic, healthcare, commercial marine, and business management. Based in Portland, Maine, USA, Diversified employs over 800 staff, with divisions in the Eastern United States, Australia, Canada, Hong Kong, Singapore, Thailand and the United Kingdom.